Tags are an easy, lightweight way to organize your contacts in Mailchimp. There are a few ways to create tags and add them to contacts. You can also rename, delete, or export tag data. 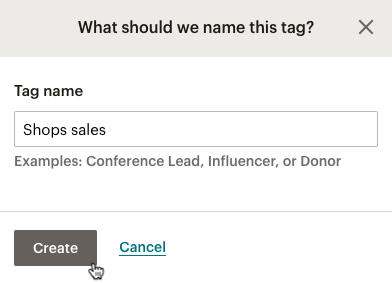 In this article, you’ll learn how to create, add, or remove tags in Mailchimp. Make sure you’re familiar with tags in Mailchimp. This article shows you how to create tags in your audience. You can also create a tag when you import new contacts or when you add a subscriber. Tag names are limited to 100 characters or less. The process to add or remove tags works the same whether you’re looking at your entire audience or a segment of your audience. To create a tag and add it to contacts from the contact table, follow these steps. Check the box next to each contact you want to tag. Click the Add Or Remove Tags drop-down menu. Type the name of your tag, and click the name of the tag to add it to your selected contacts. If you already have a tag with that name, it will appear as you type. Great job! Repeat this process to apply additional tags. To remove a tag from contact on the contact table, follow these steps. Check the box next to the contact you want to work with. Click the Add Or Remove Tags drop-down menu. We’ll display the tags assigned to that contact or contacts with checkmarks next to them. Click the tag you want to remove. That’s it! You’ll see the updated information on the contact table. You can add or remove tags for individual contacts from their contact profile page. To add a tag to a single contact from their contact profile page, follow these steps. Click the contact you want to tag. In the Tags section of the contact profile, click the Plus (+) icon. Type the name of your tag, and click the name of the tag to add it. If you already have a tag with that name, it will appear as you type. That’s it! The tags for that contact will appear under the Tags heading. If you make a mistake or change your mind, you can easily remove tags from a contact on their profile page. Just click the X icon next for the tag to remove it. 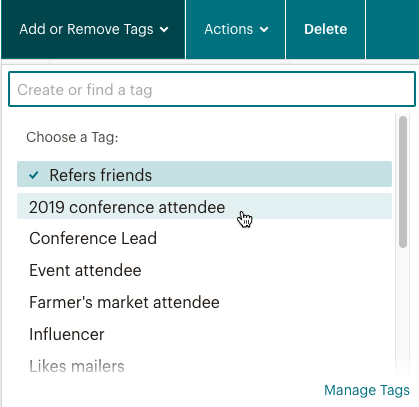 From the Tags page in your account, you can tag multiple contacts in your audience or create new tags to apply to contacts later. You can also delete tags from your entire audience. 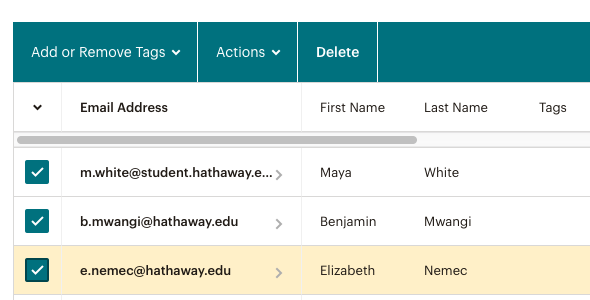 However, if you need to remove a tag from certain contacts but leave the tag intact, follow the instructions in this article for removing tags from either the contact profile or the contact table. To create a new tag to apply to contacts later, follow these steps. Type the name of your tag, and click Create. All set! You’ll see your new tag listed on the Tags page. You can assign your tag to contacts from the contact table or on a contact profile page. 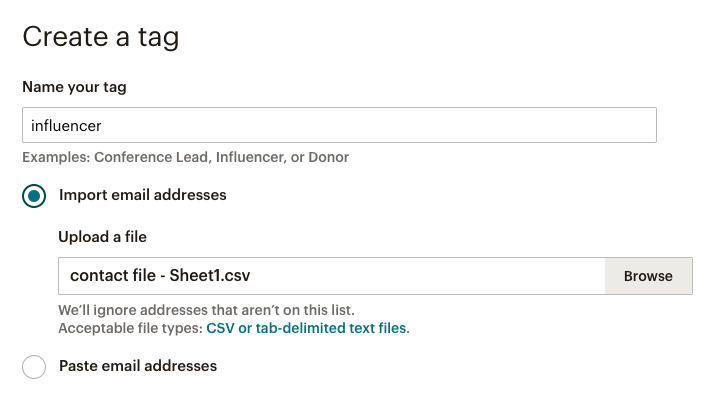 To create a new tag and add it to contacts in your audience with a CSV file or by pasting addresses, follow these steps. On the Create a tag screen, type the name of your tag, and choose Import email addresses or Paste email addresses. Depending on which option you chose, upload your CSV file or paste in your addresses. We’ll ignore any addresses that aren’t already in your audience. Awesome! We’ll display a success message at the top of the screen, and you’ll see your new tag listed on the Tags page. To view the contacts associated with your tag, click View. 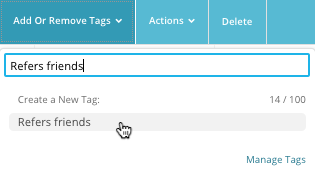 Learn how to access the Tags page, where you can view, manage, and create tags for your list.